Weekly Wine Pick: 2010 Gary Farrell Sauvignon Blanc Redwood Ranch! This week's wine pick hails from California's Sonoma County, home to many a world-class Pinot Noir and Chardonnay. The 2010 Gary Farrell Sauvignon Blanc Redwood Ranch is neither, yet represents a delightful choice for the steamy days of Summer at a more affordable price. The pioneering Gary Farrell Vineyards & Winery is best known for producing single vineyard Chardonnays and Pinot Noirs from the Russian River Valley but has also created this lovely expression of the Sauvignon Blanc grape. The fruit for this wine is sourced from Redwood Ranch located at the extreme southern end of the Alexander Valley. The Redwood Ranch has been producing exceptional fruit for the past five decades and growers Jim and Gayle Reed are committed to implementing sustainable winegrowing methods to ensure that tradition continues. This 100% Sauvignon Blanc has a lovely pale straw hue with alluring aromas of citrus, peach and a hint of vanilla. On the palate flavors of juicy citrus, white peach, grass and a refreshing acidity make it very hard to put this wine down! This is a delicious wine for Summer and, with a kiss of oak, it has more complexity than your everyday Sauvignon Blanc. While it's perfect for enjoying on its own, it will also pair beautifully with the bright, fresh flavors of Summer including salads, grilled chicken and especially shellfish! Food Pairing: Shellfish, salads, grilled chicken or nothing at all! The Ultimate Breakfast Comfort Food: Red Velvet Pancakes! If you are looking for the ultimate in comforting breakfasts - look no further! On a recent stormy Sunday, I was in search of a breakfast to take our minds off of the dreary, inclement weather. I knew I had succeeded when I happened upon a recipe for Red Velvet Pancakes. As a huge fan of all things red velvet, this recipe deliciously translates the fabulous flavor into breakfast form. I tweaked the original recipe in order to ensure the pancakes turn out their beautiful, signature red color. The trick is to cook them over medium-low heat and make sure to re-butter the pan between batches - you want to avoid the pancakes turning brown. Serve them simply with a side of bacon and some fruit (and maybe even a Mimosa or Bloody Mary) and you are all set - enjoy! Whisk flour, baking powder, baking soda, salt, sugar and cocoa powder in a bowl. Sift if necessary to remove lumps. In a larger bowl, beat the egg with buttermilk, sour cream, food coloring and vanilla extract until smooth. Slowly whisk in the flour mixture, adding melted butter in gradually. Whisk until all lumps are out. Melt a tablespoon of butter in a large nonstick pan over medium-low heat. Drop in batter 1/4 cup at a time to form pancakes. Add additional butter for each batch of pancakes. Flip pancakes when bottoms are set and bubbles form on top. Cook until firm and fluffy. Serve warm with a dusting of confectioner's sugar and cream cheese and/or maple syrup. Bal Harbour Just Got Even More Fabulous: Chef Jean-Georges Vongerichten's J&G Grill! My fellow Foodies and Fashionistas, now there's yet another delicious reason to visit Bal Harbour, South Florida's world-class shopping destination! Located directly across the street from the heralded shops, ensconced in the über-chic St. Regis Bal Harbour Hotel is world renowned Chef Jean Georges Vongerichten's latest culinary outpost: J&G Grill. The eatery exudes modern elegance with a beautiful, airy dining room replete with distinguished grey oak herringbone floors and expansive floor to ceiling views of the Atlantic Ocean. The decor is modern yet warm with creative light fixtures and welcoming banquettes against a backdrop of majestic palm trees. The inviting hues of the space are the perfect venue for the exquisite cuisine which is just as much a feast for the eyes as it is for the palate. The staff was equally inviting and we were greeted warmly and shown to a lovely table for two overlooking the ocean. We started with chilled flutes of Veuve Clicquot Brut Rosé Champagne and a lovely amuse bouche of Watermelon with Goat Cheese and Black Pepper. This mouth watering pairing certainly set the tone for the deliciousness to come. A duo of Sashimi followed, beginning with Hamachi Sashimi with Ginger Vinaigrette and Avocado. Light, colorful and full of flavor this dish demonstrated the thoughtful presentation and impressive attention to detail inherent in every dish we sampled throughout the evening. The hamachi was fresh and succulent and the subtle spice of the ginger vinaigrette lingered like a memorable kiss. The Ahi Tuna Citrus and Avocado also featured ingredients at the peak of freshness and flavor. This delicious duo definitely left us wanting more! The Hearts of Palm Salad with Coconut Dressing was refreshing with lots of fabulous texture. 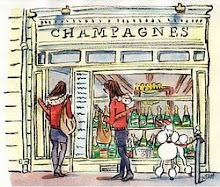 It paired remarkably well with an elegant white Burgundy, the '09 Vincent Girardin Puligny-Montrachet 'Vieilles Vignes.' The wine's creaminess was nicely matched with the overall texture and weight of the dish while it's acidity was a nice foil to the richness of the coconut and avocado. This wine also paired very well with our next dish, a vibrant green Spring Pea Soup with Croutons. In the creative presentation, the soup is poured atop a dollop of foam and a smattering of croutons to create a frothy, inviting bowl of deliciousness that highlights the fresh flavors of Spring with a hint of decadence. We really kicked things up a notch with our next dish: Petrossian Caviar with Crispy Fried Egg, Toasted Brioche Cube and Vodka Crème Fraîche. Yes, you read that right! This dish was decadence and comfort food rolled into one and I would be more than happy to have this for breakfast any day of the week! The egg was cooked to perfection and the vibrant yellow yolk created a deliciously oozy sauce that brought all the elements of this spectacular dish together. This one is a definite must try!!! Next, a duo of fresh fish was complemented beautifully by an '09 Archery Summit Premier Cuvée Pinot Noir. It was very refreshing to have red wine paired with fish, again demonstrating the insightful pairings by our Sommelier. The Snapper with Edamame, Tomatoes and Fresh Thyme was delicious and full of flavor as was the Seared Mahi with Fermented Black Bean Vinaigrette and Bok Choy with Mint. The wine paired especially well with the mahi and it's subtle heat and flavor of fresh mint. In a departure from seafood, we then sampled the Soy Glazed Short Rib with Apple-Jalapeño Puree and Rosemary Bread Crumbs. As a longtime fan of the short rib, this one was delectable with the exceptional "no-knife-necessary" texture only 14 hours sous vide can provide. In addition to the succulent texture of the meat, this dish also demonstrated the mastery of flavors that was so well choreographed and executed in all the dishes we sampled. The crisp, fresh flavor of the green apple and the spice of the jalapeño was a nice contrast to the decadent short rib. The '08 Nine Hats Sangiovese from Washington state's Columbia Valley rounded things out very nicely. Thankfully, the dedication to food and wine pairing at J&G Grill also extends to the dessert menu! We enjoyed the '08 Alvear Pedro Ximinez Montilla-Moriles de añada with its notes of date, toffee and fig with a delightful Warm Chocolate Cake with Vanilla Ice Cream. We also had the chance to sample a Tropical Fruit Vacherin with Key Lime Gelee and Shards of Meringue that was a wonderful mixture of sweet and tart. J&G Grill is a wonderful addition to the South Florida fine dining scene. We were very impressed with every aspect of our experience, from the ambiance to the delicious and innovative food that delivers everything it promises. 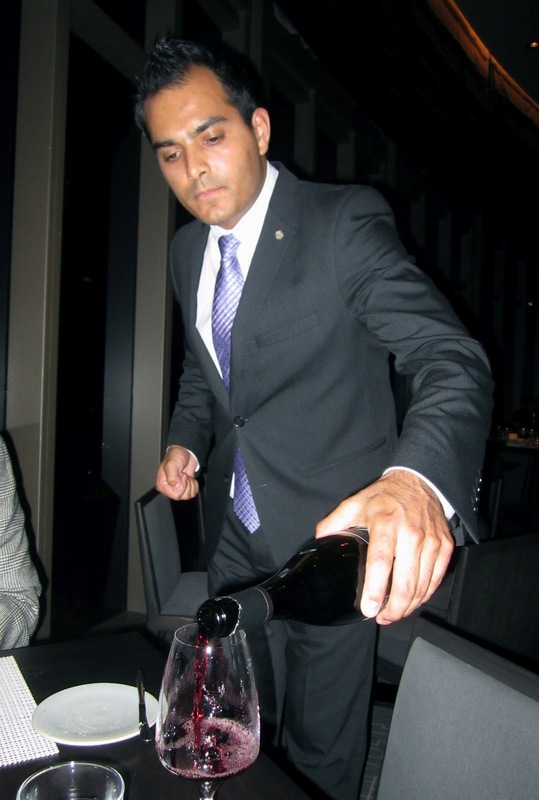 The extensive wine list and knowledgeable staff also make enhancing your experience with wine a real pleasure. While it is pricey, this is indeed a very special establishment that combines the South Florida experience with culinary excellence wonderfully executed by Chef de Cuisine Richard Gras. Next time you're in the mood for something special, give J&G Grill a try! J&G Grill is located at the St. Regis Bal Harbour Resort at 9703 Collins Avenue, Bal Harbour, FL 33154. For reservations or more information, please call 305-993-3333 or visit www.jggrillmiami.com. "Savoring the Summer" with the Wines of Masi & Max's Harvest! The Lineup of Venetian Beauties! Last Wednesday we kicked off our "Savor the Summer" Wine Dinner Series - a delicious collaboration between Moi, The Glamorous Gourmet, and Max's Harvest, a fabulous local restaurant located in the Pineapple Grove neighborhood of Delray Beach, Florida. The evening featured the Venetian wines of Masi paired with the delicious cuisine of Executive Chef Chris Miracolo. We were also very fortunate to have the charming Tony Apostolakos, US Director of Masi joining us for the evening. Tony was kind enough to share the very interesting history and tradition behind these wines which have been referred to as, "modern wines with an ancient heart." With its roots in Valpolicella, one of Italy's best known wine regions, Masi makes quality wines that are an expression of the values of their territory of origin. Today, Masi is recognized as a leader in the production of Amarone and is well-known for their use of the Appassimento technique in the production of their wines. Brimming with flavor, structure and balance these wines beautifully showcased the variety and potential of the Venetian wine region. As is the case with the majority of Italian wines, these wines were also perfectly suited for pairing with fabulous cuisine and in the extremely capable hands of Chef Chris Miracolo - our guests were definitely in for a real treat! A few weeks before the dinner I had the pleasure of tasting through the wines with Chef Chris who subsequently built each dish around the nuances of each wine. I am very happy to share with you the delicious results! As guests arrived they were greeted with flutes of Bellavista Franciacorta Cuvée Brut NV, a sparkling wine from the Lombardy region of Italy crafted from 80% Chardonnay and 20% Pinot Bianco and Pinot Nero. Paired with this lovely sparkler were beautiful trays of George Blanc Potato Clouds with Lemon Creme Fraiche and Paddlefish Roe. The saltiness and citrus of the Potato Clouds were a fabulous match for the crisp acidity and refreshing effervescence of the Franciacorta. I could've eaten ten of them (actually, I might have!). Butter Poached Maine Lobster with Mango & Micro Basil! Once guests were seated, the festivities began with an amuse bouche of Butter Poached Maine Lobster with Backyard Mango & Micro Basil. This dish was paired with our only still white wine of the evening, the 2011 Masi Masianco, a blend of 75% Pinot Grigio and 25% Verduzzo. While the Pinot Grigio for this wine was fermented in stainless steel tanks, the Verduzzo grapes were ripened on racks following harvest and then the resulting wine aged for a period of time in oak barriques to give it a lovely body and richness. The wine's mango and citrus notes nicely complemented the flavors of the dish while its food-friendly acidity easily balanced the richness of the lobster. Ricotta Gnudi with Morels, Cacciato Tartufo & Pea Emulsion! Next was a mouth-watering Ricotta Gnudi (yes, it means "naked") with Oregon Morels, Cacciato Tartufo and Pea Emulsion. Cacciato Tartufo is an Italian Sheep and/or Cow's milk cheese flecked with fragrant bits of black truffle. As the dish was placed in front of me, I watched with great delight as the freshly shaved cheese melted atop the warm gnudi releasing its intoxicating black truffle aroma. The truffle notes and creamy gnudi paired beautifully with the 2010 Bonacosta Valpolicella, a red blend of 70% Corvina, 25% Rondinella and 5% Molinara. This wine was light and fruity with notes of bright red cherry and a hint of spice from some time spent in oak. I couldn't help but think this wine would also make an excellent Summer red especially when served with a slight chill. For our second red wine, Chef Chris created one of my favorite dishes of the evening (as if I could pick just one) entitled: A Study in Duck. This very creative dish involved three different incarnations of duck including: Duck Prosciutto with 24-hour Tomato; Crispy Duck Confit with Yam Hash & Quail Egg; and Duck Liver Agnolotti with Orange, Cherry & 25 year Balsamic and Mache. This three-part dish was paired with the 2008 Campofiorin, a blend of 70% Corvina, 25% Molinara and 5% Rondinella that employs Masi's signature double fermentation method. Campofiorin is the original "Supervenetian" introduced by Masi in 1964 which signified a new category of wines from the Veneto inspired by the technique of making Amarone. In this process the wine produced from fresh grapes is actually re-fermented using 25% of whole, semi-dried grapes of the same varieties. The wine then spends a minimum of 18 months in oak, a mixture of Slavonian and French, before being bottled and aged for another three months. The result is a wine rife with ripe red cherries, vanilla and spice that harmonized deliciously with each incarnation of duck. Seated Diver Scallop with Shortrib! Next was the 2007 Brolo di Campofiorin, a blend of 80% Corvina and 20% Rondinella. The term "brolo," the Italian equivalent of the French term "clos," refers to a vineyard surrounded by walls and represents a special selection of grapes used for its production. Compared to the Campofiorin this wine was slightly richer and more complex with notes of ripe red cherries, red berries, cinnamon and spice. It was the perfect accompaniment to the rich flavors and textures of the Seared Diver Scallop with Shortrib, Hen of the Woods Mushrooms, Sunchoke Puree and Vin Cotto. 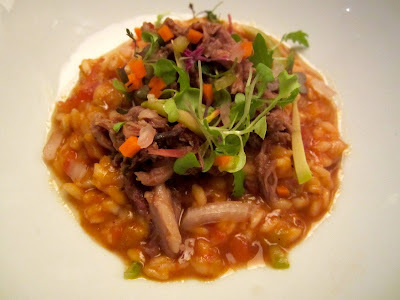 Braised Lamb Shoulder & Tomato Risotto! Next we moved on to the legendary Amarone! This wine is the product of the wine making method well known to the Romans as "appassimento" - the process by which grapes are dried in order to concentrate the wine's sugars and flavors. At the end of September or beginning of October, the best clusters of grapes from hillside vineyards are picked and laid out on bamboo racks in special lofts equipped with a “natural appassimento” control system. At the end of January the grapes weigh 35% less and have very concentrated sugars. The resulting wine as demonstrated by the 2007 Costasera Amarone is full-bodied, rich and complex and chock full of aromas and flavors of juicy black cherry, plum, smoke and spice. With it's food friendly acidity and supple tannins this delicious wine was the perfect accompaniment for the flavorful Braised Lamb Shoulder, Tomato Risotto, Cerignola Olive and Pickled Mirepoix. Our second Amarone of the evening was the 2004 Serègo Alghieri 'Vaio Armaron' Amarone Classico hailing from an historic vineyard whose name has such a coincidental similarity to the name "Amarone" that some scholars believe it to be the original source. Since 1353 the noble Serègo Alighieri family, descendants of the poet Dante, has cultivated its estate in Valpolicella with great passion. The resulting wine is extraordinarily rich and complex and capable of long term aging. The 2004 was showing beautifully with mouth watering notes of Morello cherry, dark chocolate and spice. This full-bodied wine had beautifully integrated tannins and in addition to its lovely richness, was also very well-balanced. It created a memorable and delicious synergy paired with the heavenly Chocolate Pot au Creme, with Morello Cherries & Chocolate Hazelnut Biscotti! A big thank you to Tony Apostolakos for joining us for our first "Savor the Summer" dinner and sharing the fabulous wines of Masi. I think we all came away with a new found appreciation for these special wines from Italy's Venetian wine region. Another big thanks to Chef Chris Miracolo, General Manager J. Kevin Fegan and the amazing team at Max's Harvest for creating such a wonderfully delicious evening. I'm already looking forward to our next "Savor the Summer" dinner on Wednesday, July 11th featuring "Wines that Pair with the Fabulous Flavor of Summer" - hope to see you there! 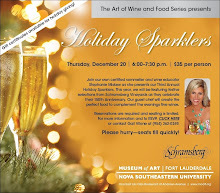 For more information or to make a reservation please call 561-381-9970 or click here.